Features: 100% Brand New. 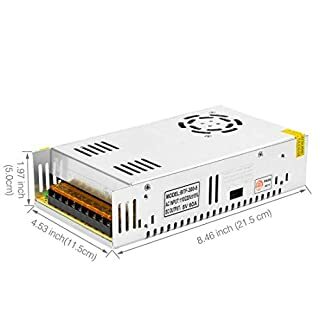 Weight:828g Size: 8.64inch x 4.90inch x 2.36inch/219.5mm x 124.5mm x 60mm(L*W*H) Input Voltage: 200V~240V/100V~120V ¡À20% Output: DC 5V60A 300W Shell Material: Metal case / Aluminum base Protection: Shortage Protection, Overload Protection, Over Voltage Protection Widely used in Industrial automation, LED display, communications, etc. 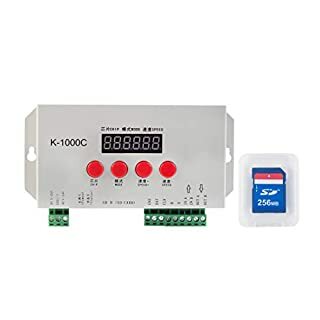 Safety Compliance: CCC/ FCC / CE Working Temperature: 0~40¡æ Storage Temperature: -20~60¡æ Ambient Humidity: 0~95% Non-Condensation Connection: L, N: AC power input COM: DC power output - V: DC power output + +V / ADJ: Adjust the output voltage (15%) Package Contents: 1 x Switching Power Supply Notes: 1. This Power Supply Unit "DOES NOT" come with installation instruction, wiring cable, on/off switch, or screws. Professional installation of qualified electrician is highly recommended. 2. 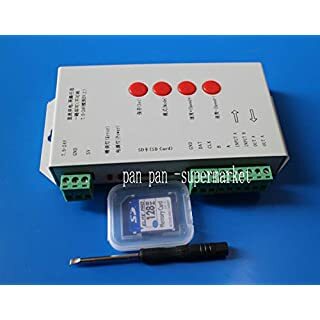 110V/220V is selected by switch before power on, please check the input voltage avolding damage. 3. IN-DOOR USE ONLY! 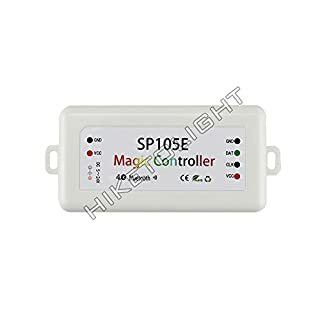 Name: SP107E Addressable LED Music ControllerWorking voltage: DC5V~24VRemote distance: 20 MetersControl up to 960 PixelsWorking temperature: -20 Celsius~60 CelsiusCertificates: CE, RoHSSync to the Rythm of musicSupport 29 LED Driver ICsIOS Ver. 10.0 or later; Android Ver. 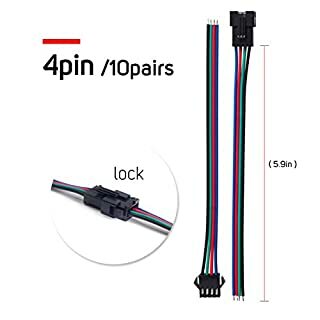 4.4 or later; Bluetooth Ver 4.0 or latercolour: whiteMaterial: ABSsize: 85*45*22mmWarning:It can support WS2812B and WS2813 but there is no option on the setting page. Please choose WS2811 when connect it to WS2812B and WS2813. 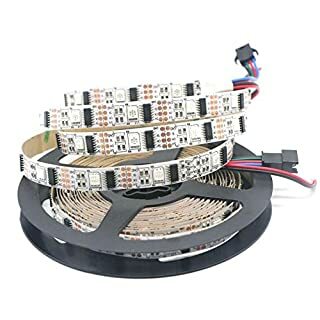 When connecting WS2813 LED strip, please connect Bi wire to GND port.The controller cannot regulate the output voltage at the VCC. That means the output voltage of your power supply must be the same as the work voltage of your led lights. 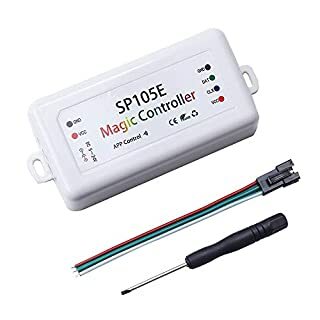 If your lights need 5V input, please use a 5V power supply, never use 12V or 24V power supply.The controller only supports LED lights with smart IC. 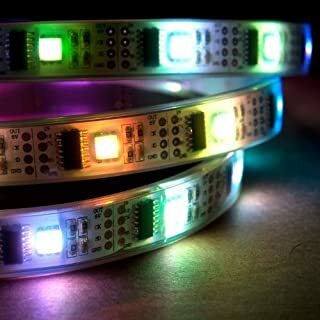 It cannot support ordinary RGB/RGBW LED strip without IC.Please use a power supply not a battery to power the controller. The output power of power supply must be more than the max power of led light. 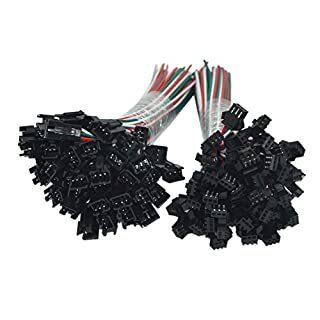 Part of the color effects that the controller can displayPackage Contents:1x SP107E music controller1x 3pin JST connector1x Female DC connector1x 1 to 2 Audio cable1x Mini screw driver1x User manualOnly the above package content, other products are not included.Note: Light shooting and different displays may cause the color of the item in the picture a little different from the real thing. The measurement allowed error is +/- 1-3cm. * TOOGOO is a registered trademark. ONLY Authorized seller of TOOGOO can sell under TOOGOO listings.Our products will enhance your experience to unparalleled inspiration. 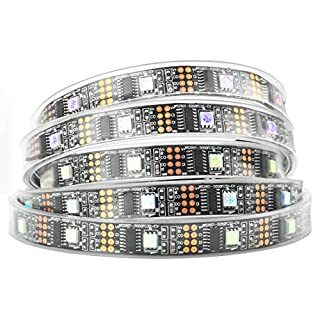 TOOGOO(R) SP108E Wireless Bluetooth Controller APP WS2811 WS2812B WS2801 SK6812 APA102 Individually Addressable Programmable LED Strip Pixel Module Panel Light DC5V-24V for IOS/AndroidWorking Temperature: -20~60 Degrees CelsiusWorking Voltage: DC5V~24V;Working Current: 20mA~130mA;AP Mode Remote Distance: 45FT;Product Weight: 40g;AP (Access Point) mode: Controller and Phone connect directly, controller works as an access point.Connect steps: When the device is not connected to any WIFI network, power on the controller, controller will be remain in Wait-For-Connect mode for 20 seconds;Make sure that your phone is connected to a WIFI network, Open LED Shop APP, pressing the Add Device button, input the WIFI pin code, then press the OK to confirm and wait for the configure processing finish;When controller successfully enter the WIFI network, it will be showed on the device list;User can select the controller and remove it out of the network by pressing the Remove Device button, then the controller will switch into AP mode.color: White Material: ABSSize: 85*45*22mm Package Contents: 1 x SP108E Bluetooth LED controller1 x 3pin female JST connector1 x Mini screwdriver1 x User manualOnly the above package content, other products are not included.Note: Light shooting and different displays may cause the color of the item in the picture a little different from the real thing. The measurement allowed error is +/- 1-3cm. JVSISM is an authorized brand. Only the sellers under authorization can start selling the products in JVSISM brand. Our products will bring the excellent and first-class shopping experience to customers. 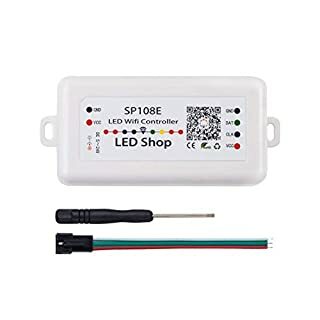 Name: SP107E Addressable LED Music ControllerWorking voltage: DC5V~24VRemote distance: 20 MetersControl up to 960 PixelsWorking temperature: -20 Celsius~60 CelsiusCertificates: CE, RoHSSync to the Rythm of musicSupport 29 LED Driver ICsIOS Ver. 10.0 or later; Android Ver. 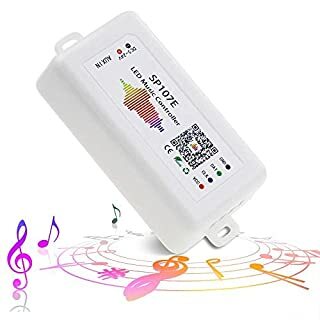 4.4 or later; Bluetooth Ver 4.0 or latercolour: whiteMaterial: ABSsize: 85*45*22mmWarning:It can support WS2812B and WS2813 but there is no option on the setting page. Please choose WS2811 when connect it to WS2812B and WS2813. 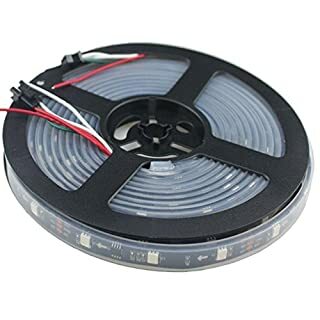 When connecting WS2813 LED strip, please connect Bi wire to GND port.The controller cannot regulate the output voltage at the VCC. 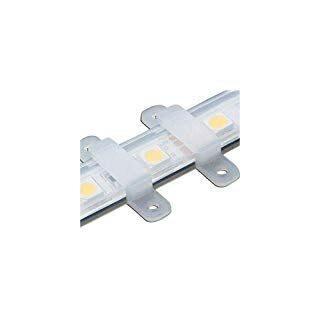 That means the output voltage of your power supply must be the same as the work voltage of your led lights. 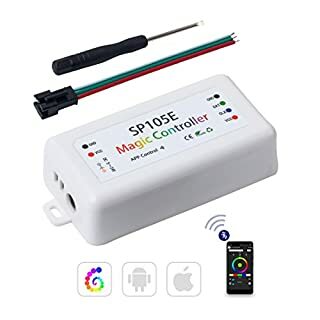 If your lights need 5V input, please use a 5V power supply, never use 12V or 24V power supply.The controller only supports LED lights with smart IC. 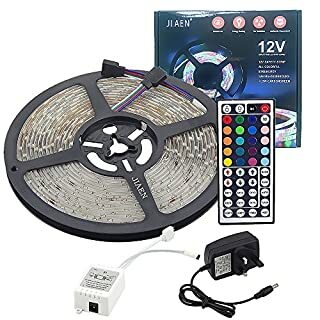 It cannot support ordinary RGB/RGBW LED strip without IC.Please use a power supply not a battery to power the controller. The output power of power supply must be more than the max power of led light. 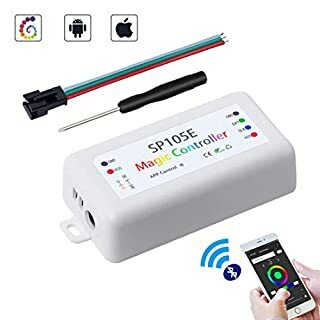 Part of the color effects that the controller can displayPackage Contents:1x SP107E music controller1x 3pin JST connector1x Female DC connector1x 1 to 2 Audio cable1x Mini screw driver1x User manualOnly the above package content, other products are not included.Note: Light shooting and different displays may cause the color of the item in the picture a little different from the real thing. The measurement allowed error is +/- 1-3cm. 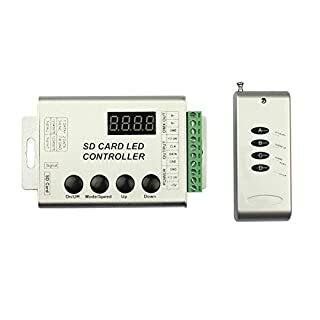 LED T1000S 128 SD Card Pixels Controller,DC5~24V,for WS2801 WS2811 WS2812B LPD68Note:The colors deviation might differ due to different monitor settings.We provide you with the best product and service, if you have any problem, please let us know, and we will solve the problem ASAP. Thank you so much.